To predict how our nation will fare tomorrow, we need to look at how our youngest children are faring today — and the numbers are not all that promising. 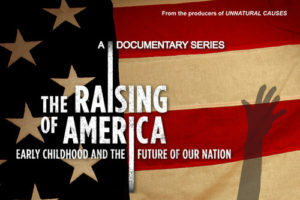 Join us for a screening of the documentary film “The Raising of America” with community discussion after. We’re working to change the conversation so that more parents and children have access to the kind of care they need — but we can’t do it without first knowing about the problem. Come learn about the care crisis in the U.S., and how you can be a part of promoting and affecting the transformation many working families so desperately need. Sign up here to join us on October 20th! If you have any questions about this event, contact Regional Outreach Director, Laurie, at laurie@familyforward.org.